> Adjustable DC Power Supplies are easy to come by, but high current, adjustable power supplies are another matter. They are typically either fairly expensive, or difficult to find. 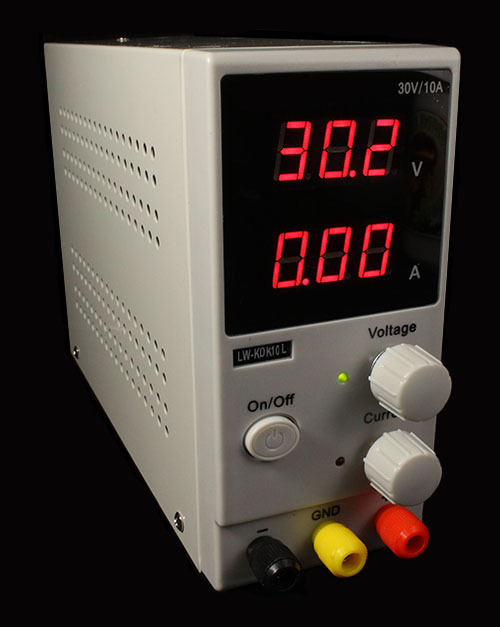 Our DC Power Supply is ideal for laboratory, workshop or school use. The output voltage is adjustable from 0 to 32 volts and the current from 0 to 10 amps. It is highly reliable - equipped thermal, overload and current limiting protection circuitry. It is also internally fan cooled to prevent overheating at maximum output for extended periods of time. If you've been looking for an affordable, reliable, all-purpose, adjustable DC power supply for your shop or lab (that can provide a decent amount of current), you just found it.